About Us - Triways has been in business since 1978, a proud family values company. 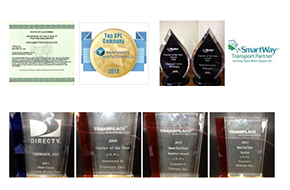 Award winning 3pl company leading Southern California. Triways, Inc., a privately-owned California corporation, started in 1978 as a local drayage carrier operating within the Los Angeles basin. Later, we expanded our services to include public warehouse operations, and our servicing area to include Arizona and Nevada regions. This expansion was perhaps the most significant turning point in Triways history, because it marked the beginning of a continuous period of growth that has culminated in our becoming a major player in the Southern California area in providing both transportation and warehousing services. Triways focused on becoming a true, “full-service distribution provider” to our customers. We realized that many manufacturers need to partner with a warehouse and distribution company that offers something other than “just another truck carrier salesman spouting that same old, standard sales line.” You know the one: “Here is our points list, and here are our rates, we would like you to use us in your distribution system.”. We decided to take a different approach. We realized that major national retail chains such as Wal-Mart and Home Depot want vendors to have their replenishment stock near to their points-of-sale. To meet the stringent needs and requirements of these retail chains in California, vendor manufacturers must do one of two things. Either set up their own West Coast distribution centers, or partner with a company that can provide the same flexible array of transportation and distribution services as they would receive had they set up their own distribution centers. To meet that need, we negotiate “full-service contracts” with our major national manufacturing customers that sell to national retail chains.. Under this full service agreement concept, we create individualized programs to meet the needs of each customer. We develop a contract that contains many pricing factor variables specifically tailored for that organization. For example, if your company needs pricing based on a rental factor plus labor, we can accommodate you. Perhaps you want charges to be based on a per order shipped basis, or per carton, or per hundredweight, or any other variable. No problem! As long as we can structure in a reasonable profit margin, we will do it for you..
We operate differently than most third party logistics companies. Most companies under-perform. Triways consistently outperforms the competition, in large part because of our Philosophy and commitment to our customers. We shall operate on the premise that the only satisfactory business relationship is one that genuinely benefits both customer and company. We shall fulfill the obligations of all contracts in the most efficient, expeditious, and professional manner. We shall focus our personal attention on customer satisfaction as the foundation of continuous growth and development of our company. We shall accept only those tasks and contracts that we can competently perform within strict adherence of the suggested schedule or timetable. © Copyright 2016. Triways Inc.